Oceanside Real Estate is considered to be the most affordable beach town and Oceanside homes are the least expensive homes in all of San Diego County. It's not unusual for Real Estate in Oceanside to be half the price of Del Mar and La Jolla properties. 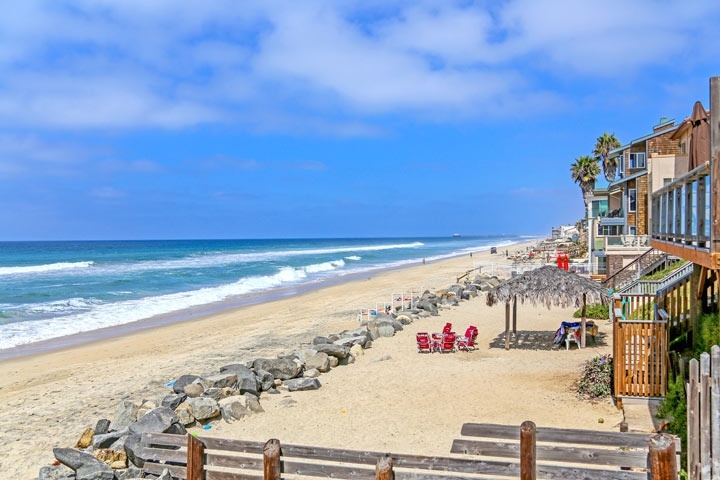 The beach town dates back to the early 1920's when the homes were marketed to weathly businessman in the Los Angeles area as a nice beach community located at the mid way point between San Diego and Los Angeles. There are many distinct neighborhoods that offer the charm and personality of these older homes and can be found in the Saint Malo neighborhoods. The Saint Malo Beach community is one of the oldest and most distinguished neighborhood as it sits directly on the ocean front. The homes are built in the French Normandy style and located in a secure gated community. Oceanside also has a wide variety of neighborhoods that span over 4 different zip codes. Some of the homes can still be bought for well under $500,000. Location will typically determine the price in Oceanside as the more expensive homes can be found closer to the beach. To understand the city better we have broken down the different areas of Oceanside here. Interested in Oceanside Real Estate for sale? For a complete list of Oceanside homes for sale please visit our Oceanside MLS search to the right. All Oceanside homes and Oceanside Condos for sale are also listed below in the various Oceanside neighborhoods. Questions regarding any of the homes or neighborhoods listed here in Oceanside? Please contact us anytime at 1-888-990-7111 today. "A Cavalier home in Oceanside, California has just been sold by Beach Cities Real Estate agent Valentina Herzog who represented the buyer. nbsp;208 Evergreen Parkway, Oceanside sold for $130,000 and... "
"An Arbor Hill home in Oceanside, California has just been sold by Beach Cities Real Estate agent Alex Cifelli who represented the buyer. nbsp;432 Edgehill Lane 127 sold for $244,000 and closed escr... "
"An Oceanside, California home in the Mesa Margarita neighborhood has just been sold by Beach Cities Real Estate agent Dan Benjamin who represented the buyer. nbsp;636 Parker Street, Oceanside sold... "